The present study included a collecting of 165 specimens form different sources, 93 isolates were identified as Escherichia coli depending on morphological and biochemical tests in addition to automated systems such as VITEK 2 and api 20E. All isolates under study developed high resistance toward cefotaxime, ceftazidime, ceftriaxone, and ciprofloxacin estimated by minimum inhibitory concentration. Stool and wound specimens characterized by harbouring the highest resistant isolates in a percentage reached 100% against antibiotics under study. Insignificant differences were found between isolates collected from males and females. Upon using disk displacement method to detect extended spectrum beta lactamases (ESBL), it was found that 37.73% of isolates were ESBL producers. However, stool and urine specimens harboured the highest percentage of producers. The present study findings revealed a presence of efflux pump in 77.5% of tested isolates using cartwheel method. Nevertheless, PCR technique exposed about 85% of isolates harboured acrAB efflux pump gene. Moreover, the results of this study illustrated that all isolates contained gyrA and parC using PCR technique. Accordingly, three isolates were chosen for nucleotide alignment study; one of them is sensitive and the other two are resistant to ciprofloxacin (acrAB free). The results showed a presence of stable and frequent three mutations in the resistant isolates (14 and 3). A transition mutation found in the site 4808116 in which guanine is replaced by adenine. Furthermore, two transversion mutations were located in 4804221 and 4808222 sites. Additionally, a hot spot was detected in the site 4808109. تضمنت الدراسة الحالية جمع 165 عينة سريرية من مختلف المصادر شملت الادرار و الخروج و الجروح و الحروق. شخصت 93 عزلة من بكتريا الايشريشية القولونية اعتمادا على الفحوصات المظهرية والبايوكيميائية واستعمال ابي 20 ونظام الفايتك اظهرت العزلات مقاومة عالية لمضادات السيفوتاكسيم والسفتازيديم السفترياكسون والسبروفلوكساسين وذلك بطريقة حساب التركيز المثبط الادنى وتميزت عينات الخروج والجروح احتوائها على العزلات الاكثر مقاومة بنسبة (100%) للمضادات الحياتية قيد الدراسة . ولم تظهر فروق معنوية بين نسب العزل في الاناث والذكور. باتباع طريقة استبدال الاقراص للتحري عن انزيمات البيتالاكتاميز موسعة الطيف تبين ان 37,73% من العزلات كانت منتجة للانزيم وتميزت عينتا الادرار والخروج بإيواء النسبة الاكبر من العزلات المنتجة . اوضحت نتائج الدراسة الحالية وجود مضخة الدفق في 77,5 % من مجموع العزلات المختبرة وذلك باستعمال طريقة عجلة العربة في حين كشفت تقنية تفاعل البلمرة المتسلسل عن وجود جين مضخة الدفق acrAB في 85% من العزلات المختبره . كذلك اظهرت نتائج هذه الدراسة وجود جينات gyrA و parC في جميع العزلات التي انتخبت لهذا الغرض وانتخبت ثلاث عزلات منها الاولى حساسة لمضاد السبروفلوكساسين واثنان مقاومه له وخالية من جين acrAB لدراسة التطابق تسلسل النيوكليتيدات والتي اظهرت ثلاث طفرات ثابتة ومتكرره في العزلتين 14و38 المقاومتين للسبروفلوكساسين حيث تظهر طفرة الاستبدال المكافي في الموقع 4808116 الذي يتحول فية الكوانين الى ادنين كما ظهرت طفرتين من نوع الاستبدال غير المكافي في الموقعين 4808221 و 4808222 . فضلا عن ذلك ظهرت طفرة نقطة ساخنة (Hot spot) واحدة ثابتة في الموقع 4808109. Helminthes are among transmitting pathogens including Ancylostomiasis, Ascariasis, Enterobiasis, Hymenolepiasis, Strongyloidiasis, Taeniasis, Trichuriasis, Schistosomiasis, Echinococcosis. These helminthes have high effect on public health in human population around the world. Iraq is one of the most important endemic areas in the Middle East.The objective of this study is to determine the prevalence of some parasitic helminthes in Iraq from 2011 until 2015. 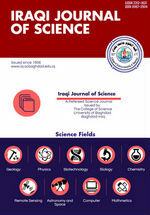 This study was carried out in all Iraqi governorates from 2011until June, 2015.In 2015, the results showed that 6 patients were infected with Ancylostomiasis, 89 patients were infected with Ascariasis, 56206 patients were infected with Enterobiasis, 173patients were infected with Hymenolepiasis, non-patient infected with Strongyloidiasis. 25patients were infected with Taeniasis, 9 cases were infected with Trichuriasis. During the last five years, Iraq was absent of schistosomiasis. Conceding Echinococcosis infection, there were a total of 4769 patients. In 2011, 2012 and 2013 Najaf showed the highest incidence rates of infections 302 patients,277 patients and 215 patients respectively, while Babel, Salaheldin, Wasit, Anbar and Baghdad kerkh governorates had the lowest rate of Echinococcosis infection. In 2014, Thiqar showed the highest incidence rates of Echinococcosis infections (168 patients).In 2015, 81 patients were found in Najaf which reveling the highest incidence rate. Baghdad kerkhdid not record any infections. In conclusion during the time of this study, Iraq successfully eliminate Strongyloidiasis and schistosomiasis, on the other hand Enterobiasis and Echinococcosis represents a health problem in Iraq الديدان الطفيلية من بين اهم مسببات الأمراض بما في ذلك الأنكلستومات، داء الصفر، داء السرميات، داء الديدان الدبوسية، الأسطوانيات، الشريطيات، داء المسلكات، البلهارزيا، مرض الأكياس المائية. هذه الديدان لها تأثير كبير على الصحة العامة في جميع أنحاء العالم. العراق هي واحدة من المناطق الموبوءة الأكثر أهمية في الشرق الأوسط. الهدف من هذه الدراسة هو تحديد وبائية بعض الديدان الطفيلية في العراق من عام 2011 حتى عام 2015. قد أجريت هذه الدراسة في جميع المحافظات العراقية من عام 2011 حتى عام 2015. في عام 2015، أظهرت النتائج أن 6 أفراد كانوا مصابين بداء الأنكلستومات ، 89 شخص مصاب بداء الصفر، 56206 مصاب بداء السرميات، 173 شخص بداء المحرشفات, 25 شخصا بداء الشريطيات، 9 شخصا بداء المسلكات. خلال الفترة من 2011 الى 2015 كان العراق خاليا من اصابات البلهارزيا في حين سجلت ما مجموعه 4769 حالة مرضية بالأكياس المائية في عام 2011. بينما خلال الاعوام 2012 و 2013, 2014 سجلت النجف أعلى معدلات الإصابة 302 مريضا و 277 مريضا و 215 مريضا على التوالي، في حين سجلت بابل، صلاح الدين، واسط، الأنبار وبغداد الكرخ أدنى معدل اصابة بمرض الأكياس المائية. في العام 2014 سجلت محافظة ذي قار اعلى معدلات اصابة (168) بمرض الأكياس المائية.في عام 2015، تم العثور على 81 مريضا في النجف التي سجلت أعلى معدل للاصابة بينما بغداد الكرخ لم تسجل أي إصابات. خلال فترة هذه الدراسة يمكن الاستنتاج ان العراق نجح بالقضاء على داء الأسطوانيات والبلهارزيا من ناحية أخرى لازال داء الدبوسياتوداء الأكياس المائية يمثل مشكلة صحية في العراق. A microbial contamination of several primary schools (official and private) in Baghdad city was conducted. Sampling was performed in each school from desk, door handle, and hand of students. Out of 113swabs (classes desk, door holder, and students hands ) obtained from ten primary schools, growth wasobserved in 91 samples (80.5%) (for official school 84.6% and 71.4 for private school. The results of recent study revealed that the official schools showed higher contamination levels(130 CFU ) than private ones (90 CFU). Resultes revealed that a total of 12 morphologically different bacterial species were isolated from 62 bacterial isolates,among which gram negative bacteria 40 isolates(64.5%) were higher than gram-positive bacteria 22 isolates( 35.4%). According to the microscopic examination , biochemical tests and API system , the results was showed that staphylococcus epidermidis was the most frequently isolated bacterial species with recovery rate 10 (16 .1%). followed by staphylococcus aureus 8 ( 12.9 %) Escherichia spp7 (11.2%) Escherichia coli7 (11.2%), Enterobacter sakazaki 5(8%), Enterobacter cloacae 5 (8%), Bacillus spp 5(8%), Pseudomonas aeruginosa 4(6.45%), Klebsiella spp 4(6.45%), Klebsiella pneumoniae 3(4.8%), Streptocoocus spp 3(4.8%), Proteus mirabilis 1(1.6%). أجريت دراسة للتلوث المايكروبي لعشرة مدارس إبتدائية ( حكومية و أهلية ) في مدينة بغداد و قد تم أخذ العينات لكل مدرسة من ( مقاعد الطلاب و مقابض الابواب و أيدي الطلاب ) . أخذت اكثر من 113 مسحة ( مقاعد و ايدي الطلاب و مقابض الابواب ) من عشرة مدارس ابتدائية و قد لوحظ النمو في 91 ( 80.5 % ) من العينات المدارس الحكومية كانت (84.6 %) و في المدارس الاهلية (71.4%), أيضا تم فحص العينات المأخوذة لمعرفة مستوى التلوث المايكروبي بوساطة حساب وحدة تكوين المستعمرة لكل سطح. وفقا للنتائج اظهرت المدارس الحكومية تلوث اعلى( 130 وحدة تكوين المستعمرة ) مقارنة بالمدارس الاهلية (90 وحدة تكوين المستعمرة). اظهرت النتائج وجود 12 نوع بكتيري مختلف من مجموع 62 عزلة بكتيرية وكانت نسبة البكتريا السالبة لصبغة كرام64.5 % (40 عزلة )والموجبة لصبغة كرام 35.4% (22 عزلة). اعتمادا على الفحص المجهري والاختبارات البايوكيميائية ونظام الابي ظهرت نتائج التشخيصية التالية : staphylococcus epidermidis 10 (16 .1%). staphylococcus. aureus 8 ( 12.9 %) Escherichia spp 7 (11.2%) Escherichia.coli7 (11.2%), Enterobacter sakazaki 5 (8%),Enterobacter cloacae 5(8%), Bacillus spp 5(8%), Pseudomonas aeruginosa 4(6.45%), Klebsiella spp 4(6.45%), Klebsiella pneumoniae 3(4.8%), Streptocoocus spp 3(4.8%), Proteus mirabilis 1(1.6%). S. aureus --- MRSA --- iMLSB --- cMLS --- M phenotype --- SAB --- msrA --- msrB --- linA/linA’ --- vga. The severity of UTI produced by E. coli is due to the expression of a wide spectrum of virulence factors. In this study the role of E. coli virulence determinants in the pathogenesis of UTI in urinary catheterized and non-catheterized patients has been evaluated. The isolates were recovered from 129 patients admitted to the hospital. Virulence genes of E. coli were detected by polymerase chain reaction analysis for the prevalence of these virulence factors. The targeted genetic determinants were those coding for Type 1 fimbriae, Pyelonephritis-Associated Pili (PAP), Antigen 43 (Ag43), α-Hemolysin and Aerobactin siderophores among the studied isolates. The prevalence of genes fimH, papC, ang43, hlyA and iutA were 88.37%, 72.09%, 18.60%, 51.16% and 79.06% respectively. The fimH gene with 88.37% had a highest prevalence of virulence genes in patients with UTIs. Statistically in the present study, there was no significant difference in the prevalence of genes profiles of E. coli isolates causing UTI in non-catheterized and catheterized patients. However, all the studied strains exhibited 16 virulence gene patterns; among the strains isolated from patients with urinary catheter showed multitude and greatest diversity of genes patterns than strains from non-catheterized patients.ان شدة التهاب المجاري البولية المتسببة من بكتريا E. coli تعود الى انتاجها لطيف واسع من عوامل الفوعة. في هذة الدراسة تم تقييم دور محددات الفوعه لبكتريا E. coli في مرض التهاب المجاري البولية الماخوذة من مرضى القثطرة البوليه وغير الفثطرة البولية. وان العزلات اخذت من 129 من المرضى الذين يرتادون المستشفى. تم تطبيق تقنية تفاعل البلمرة المتسلسل للتحري عن عوامل الفوعه لبكتريا E. coli ودراسة انتشار عوامل الفوعه هذه. وكان الهدف الجيني لمحددات الفوعة وكانت للجينات المشفرة لانتاج Type 1 fimbriae و Pyelonephritis-Associated Pili (PAP) و Antigen 43 (Ag43) و α-Hemolysin و Aerobactin siderophores ضمن العزلات المدروسة. وكانت نسبه انتشار الجينات fimH و papC و ang43 و hlyA و iutA هي 88٫37٪ و 72٫09٪ و 18٫60٪ و 51٫16٪ و 79٫06٪ على التوالي. وكان الجين fimH بنسبة وجوده 88٫37٪ اكثر انتشارا بين عوامل الفوعة لمرضى خمج المجاري البولية. تبين من خلال التحليل الاحصائي لهذه الدراسة عدم وجود اي فرق معنوي في انتشار التكوين الجيني لعزلات بكتريا E. coli المسببة لمرض خمج المجاري البولية لكلا من مرضى القثطرة وغير القثطرة البولية. واظهرت العزلات في هذه الدراسة 16 نمطا جينيا وكانت السلالات المعزولة من مرضى القثطرة البولية اكثر واكبر تباينا في الانماط الجينية بمقارنتها بعزلات غير القثطرة البولية. Since decades silver was depended worldwide as a treatment to a lot of diseases ranging from burn infections, anthrax, and typhoid fever to bacterial conjunctivitis in stillbirth, but its effectiveness against biofilms is still undetermined. Salmonella is a major cause of food poisoning outbreaks especially in the third world countries. Thus, in the present study; the antimicrobial activity of silver nanoparticles (Ag-NPs) against Salmonella enterica biofilm was examined; their activity was compared with amino acid; D-Glycin and imipenem antibiotic. The result of the study revealed that Ag-NPs exhibited considerable antimicrobial property against Salmonella enterica biofilm where the minimum inhibitory concentration (MIC) was found at 50 μg/ml while MIC of D-glycin and imipenem were 50mM and 4µg/ml respectively. The isolates ability to form biofilm was assayed using the tissue culture plate (TCP) assay, all the isolates were biofilm producers but with a different thickness degrees. It was found that both of Ag-NPs and imipenem inhibited Salmonella biofilm formation, but the inhibition by Ag-NPs was more than the antibiotic imipenem, whereas D-Glycin increased the ability of Salmonella isolates to form biofilm. اعتمدت الفضة لعقود من الزمن كعلاج العديد من الامراض من إصابات الحروق والجمرة الخبيثة وحمى التيفوئيد وحتى التهاب ملتحمة العين البكتيري لدى حديثي الولادة, لكن فعاليتها ضد الاغشية الحياتية لازالت غير محددة . ولأهمية جرثومة السالمونيلا كمسبب رئيسي للتسممات الغذائية خصوصا في بلدان العالم الثالث, لذا تم اختبار الفعالية الضد ميكروبية لجزيئات النانو فضة تجاه الغشاء الحياتي لبكتريا السالمونيلا, وتمت مقارنة فعاليتها مع فعالية الحامض الاميني الكلايسين ومضاد الحياة الامبينيم. كشفت نتائج هذه الدراسة ان جزيئات النانو فضة قد أظهرت فاعلية ضد ميكروبية واضحة تجاه الغشاء الحياتي للسالمونيلا إذ كان التركيز المثبط الادنى لها50مايكروغراممل بينما كان للحامض الاميني وللمضاد 50 ملي مولرمل و4 مايكروغراممل على التوالي. اختبرت قدرة عزلات السالمونيلا على إنتاج الغشاء الحياتي باستخدام أطباق الزرع النسيجي فأظهرت النتائج أن العزلات جميعها كانت منتجة للغشاء الحياتي لكن بدرجات سمك متفاوتة. ثبطت جزيئات النانوفضة ومضاد الامبينيم تكون الغشاء الحياتي للسالمونيلا بينما عمل الكلايسين على زيادة قابلية هذه العزلات لتكوين الغشاء الحياتي. Silver nanoparticles --- Biofilm --- Salmonella --- D-glycin --- Chicken meat --- Imipenem. This research investigates the dielectric properties (impedance, dielectric constant and dielectric loss) of SiO2 Ep :TiO2 Ep nanocomposite over the frequency range of (102-106 Hz ) at room temperature. The dielectric material used is epoxy resin, while nano-sized titanium dioxide (TiO2) with grain size ( 30nm) , oxide silicon (SiO2) with grain size (12nm) in state volume ratio (0,0.05 ,0.1) .The effect of gamma by using (CS137) for period time (17) day was studied Radiation caused decreasing in real and imaginary parts of dielectric constant and impedance . تم في هذا البحث دراسة الخواص الكهربائية (الممانعة، ثابت العزل بجزأيه الحقيقي و الخيالي ) ولمدى من الترددات(102-106 Hz)وبدرجة حرارة الغرفة. المادة العزليه المستخدمة هي راتنج الايبوكسي بينما المادة المالئة هي ثنائي أوكسيد التيتانيوم ذو الحجم النانوي (nm30) و ثنائي اوكسيد السيليكون ذو الحجم النانويnm) 21) وبنسب حجميه (0,0.05 ,0.1 ) وتم دراسة تأثير التشعيع بأشعة كاما المنبعثة من مصدرالسيزيوم (137) و لمدة (17 ) يوم وقد أظهرت النتائج الحالية أن التشعيع يؤدي الى نقصان في قيمة ثابت العزل بجزأيه الحقيقي والخيالي وكذلك الممانعة . Polymer-Matrix Composites --- Dielectric Properties --- Epoxy. In this research a bilateral tin oxide (SnO2) thin films was prepared by Sol-Gel method, flow coating technique which is considered a simple and cheap technique. The horizontal sample preparation with and without the use of installed, and also with installed to vertical sample. Results of optical spectroscopy that the biggest values of the transmittance T was for horizontal films with an installed, as for the absorbance A was the biggest values of the vertical sample. For the reflectivity R was value in the horizontal films with installed, less than a horizontal films without Sticky as well as for films vertical. The results of the energy gap Eg for that direct allowed and forbidden transitions and for the indirect allowed and forbidden transfers for the studied Samples were also calculated, and they showed that the highest value of Eg was (3.85eV) for the direct forbidden transfers in the horizontal sample with installer, while the lowest value of Eg was (3.65eV) for the indirect allowed transfers without installer. The vertical film with indirect showed the lowest value for the energy gap ever (3.45eV) for the indirect allowed transitions. تم في هذا البحث دراسة تحضيرأغشية رقيقة ثنائي اوكسيد القصديرSnO2 بتقنية المحلول الجيلاتيني (Sol-Gel) بطريقة التغشية بالسكب(Flow Coating) حيث تمتاز هذه التقنية بالبساطة وقلة التكلفة . تم تحضير عينة أفقية مع وبدون استخدام مثبت, وأيضا مع مثبت لعينة عمودية . أظهرت نتائج المطيافية الضوئية أن أكبر قيم للنفوذية T كانت للاغشية الأفقية التي أضفنا لها مثبت , أما بالنسبة إلى الامتصاصيةA فكانت أكبر قيم لها للعينة العمودية , وبالنسبة إلى الانعكاسيةR فقد كانت قيمها أقل في الأغشية الأفقية مع مثبت , منها في الأغشية الأفقية بدون مثبت وكذلك لاغشية العمودية . كما بينت النتائج والحسابات في قيم فجوة الطاقة Eg في الانتقالات الالكترونية المباشرة المسموحة والممنوعة وفي الانتقالات غيرالمباشرة المسموحة والممنوعة للعينات المدروسة , أن أكبر قيمة فجوة الطاقة للعينة الافقية مع مثبت هي (3.88eV) وذلك في الانتقالات المباشرة الممنوعة , أما أصغر قيمة لعرض فجوة الطاقة للعينه الافقية بدون مثبت فهي (3.82eV) وذلك في الانتقالات غيرالمباشرة المسموحة. بينما أبدت العينة العمودية أصغر قيمة لفجوةا لطاقة على الاطلاق حيث بلغت (3.38eV) وذلك في الانتقالات غيرالمباشرة المسموحة . This research has studied the effect of addition glass fibers (woven and chopped) and Zirconium oxide Nano-particles (ZrO2) with different weight percent to the conventional poly (methyl methacrylate) (PMMA). The prepared Nano-crystalline ZrO2 powder with particle size of about 95nm was syntheses directly by sol-gel method. The gel dried at 100oC for 1 hour and annelid at 400oC for 3 hours. The conventional acrylic resin prepared with 2:1 powder to liquid ratio to prepare pure sample, composite samples prepared by reinforcing PMMA with woven or chopped glass fiber (8, 12) wt.%, and reinforcing by (1,2,3) wt.% of prepared ZrO2 Nano-powder. The structural tests include: (XRD, AFM, and FTIR). The crystallized phase composition of dried ZrO2 powder after annealing in air at 400oC has been identified by x-ray diffractometry (XRD). The grain size of dried ZrO2 Nano-particles by atomic force microscope (AFM). The impact strength (I.S.) was measured by using Charpy impact test. The mechanical test done in order to compare the impact strength between pure and composite samples. From the result, the reinforcing PMMA with glass fiber in two forms (woven and chopped) improve the impact strength, while increasing of ZrO2 Nano powder loading led to decrease the impact strength. في هذا البحث تم دراسة تأثير اضافة الياف الزجاج (حصيره, ومقطعه) و مسحوق الزركونيا النانوي بنسب وزنية مختلفة الى بوليمر البولي مثيل ميثاكرليت PMMA. مسحوق الزركونيا النانوي المحضر بحجم 95 نانومتر تم تحضيره مباشرة بطريقة ال sol-gel. تم تجفيف الجل بدرجة 100 سيليزي لمدة ساعة واحدة و حرقت بدرجة 400 سيليزي لمدة (3) ساعات تم استخدام راتنج الاكريلك التقليدي بنسبه 1:2 المسحوق الى السائل لتحضير العينه النقيه, وصُنعت النماذج المتراكبة بتقوية البولي مثيل ميثاكرليت بحصيرة والباف الزجاج المقطعة بنسب وزنية (12, 8) وكذلك باضافة (3,2,1) نسبة وزنية من مسحوق الزركونيا النانوي المحضر. تتضمن الفحوصات التركيبيه: (FTIR, AFM, XRD). حيث تم فحص تركيب الطور البلوري لمسحوق لزركونيا المجففه بعد تلدينها بدرجة 400سيليزي بواسطة جهاز ال (XRD). والحجم الحبيبي لمسحوق الزركونيا النانوي المجفف تم ايجاده بواسطه (AFM). تم قياس متانه الصدمة باستخدام فحص جاربي charpy)) بدون حز, تم اجراء الفحص الميكانيكي لمقارنة مقاومة الصدمة بين النماذج النقيه و المتراكبه. من النتائج, وجد ان تدعيم بوليمر الPMMA بالياف الزجاج بالشكلين (الحصيرة والمقطعة) يحسن من متانة الصدمة, بينما زيادة مسحوق الزركونيا النانوي يؤدي الى نقصان متانة الصدمة. Denture base --- glass fiber --- ZrO2 Nano-powder --- sol-gel. Carbon nanotubes are an ideal material for infrared applications due to their excellent electronic and photo electronic properties, suitable band gap, mechanical and chemical stabilities. Functionalised multi-wall carbon nanotubes (f-MWCNTs) were incorporated into polythiophen (PTh) matrix by electro polymerization method. f-MWCNTs/ PTh nanocomposit films were prepared with 5wt% and 10wt% loading ratios of f-MWCNTs in the polymer matrix. The films are deposited on porous silicon nanosurfaces to fabricate photoconductive detectors work in the near IR region. The detectors were illuminated by semiconductor laser diode with peak wavelength of 808 nm radiation power of 300 mW. FTIR spectra assignments verify that the thiophene groups were successfully introduced into the carbon nanotubes. SEM images reflect that the electro polymerization process gives well incorporated for the MWCNTs by PTh polymer. Characteristics of photodetector were improved after cooling the detector. Figure of merit showed a good IR radiation sensitivity and photo response, while the specific detectivity was in order of 109 cm.Hz1/2/W and at for both MWCNTs loading ratios at forward bias voltage 5 Volts. The rise time and fall time of the output signal are about 192 μs and 121μs respectively which consider good values for these types of detectorsانابيب الكاربون النانويه هي مواد مثاليه لتطبيقات الاشعه تحت الحمراء نسبه لخصائصها الالكترونيه والكهرو ضوئية الممتازه وفجوه طاقة مناسبة وثباتية الخصائص الميكانيكية والكيميائية .في هذا العمل اغشية مركبات نانويه مكونة من انابيب الكاربون النانوية متعددة الجدران وبوليمر البولي ثايوفين حضرت بطريقة البلمرة الكهربائية بنسب خلط 5Wt% و 10wt% من انابيب الكاربون النانويه متعددة الجدران في مصفوفه البوليمر. رسبت الاغشية على اسطح نانوية من السليكون المسامي لتصنيع كاشف توصيل ضوئي يعمل في منطقه الاشعه تحت الحمراء القريبة. اضئ الكاشف بواسطة ليزر شبه الموصل الثنائي بقمه طول موجي 800nm وقدرة300mW . دراسة طيف الاشعه تحت الحمراء للاغشية المحضرة اكدت ان مجاميع الثايوفين قد اتحدت بنجاح مع انابيب الكاربون النانوية. تم حساب خصائص الكاشف وقد لوحظ تحسنها بعد تبريده حيث كانت نتائج الحساسية للاشعه تحت الحمراء والربح جيدة بينما كانت قيمة الكشوفية النسبية cm.Hz1/2/W 10+9 لنسبتي الخلط وعند فولتيه انحياز امامي 5 فولت. زمن نهوض و زمن هبوط الاشارة الخارجة من الكاشف كانت بحدود 192 μs و 121 μs على التوالي وهذا يعتبر زمن جيد لمثل هذا النوع من الكواشف. حسابات العزوم رباعية القطب لبعض نظائر النيتروجين في p psd- نموذج فضاء القشرة باستعمال شحنات فعالة مختلفة. The electric quadrupole moments for some nitrogen isotopes (12,14,15,16,18N) are studied by shell model calculations with the proton-neutron formalism. Theoretical calculations performed using the different set of effective charges due to the core polarization effect. The effective charges in the p-shell nuclei are found to be slightly different from those in the sd-shell nuclei. Most of the results we have obtained are underestimated with the measured data for the isotopes considered in this work. تمت دراسة العزوم رباعية القطب لبعض نظائر النتروجين من خلال حسابات نموذج القشرة وبصيغة برتون نيوترون . الحسابات النظرية التي اجريت بااستخدام مجموعة مختلفة من الشحنات الفعالة المختلفة والناشئة عن تأثير استقطاب القلب. وجدت الشحنات الفعالة للنوى في قشرة p اختلاف بسيط من تلك نوى في غلاف sd . اغلب النتائج التي حصلنا عليها كانت تحت النتائج العملية للنظائر المفترضه في هذا العمل. The depth of causative source of gravity is one of the most important parameter of gravity investigation. Present study introduces the theoretical solve of the intersection point of the horizontal and vertical gradients of gravity anomaly. Two constants are obtained to estimate the depth of causative source of gravity anomaly, first one is 1.7807 for spherical body and the second is 2.4142 for the horizontal cylinder body. These constants are tested for estimating the depth of three actual cases and good results are obtained. It is believed that the constants derived on theoretical bases are better than those obtained by empirical experimental studies يعد عمق المصدر المسبب للجذبية الارضية احد اهم المعاملات في الاستكشاف الجذبي. تقدم الدراسة الحالية حلا نظريا لنقطة تقاطع الانحدار الافقي والعمودي للشواذ الجذبية. جرى الحصول على ثابتين لتخمين العمق المسبب للشذوذ الجذبي، الاول مقداره 1.7807 للجسم كروي والثاني مقداره 2.4142 للاسطوانه الافقيه. جرى اختبارالثابتين لتخمين العمق لثلاث حالات حقيقة وتم الحصول على نتائج جيدة. لذا يعتقد ان الثابتين اللذين تم الحصول عليهما نظريا هما افضل من تلك التي يتم الحصول عليها من الدراسات التجريبية. Late Paleocene –Early Eocene algae and benthic foraminifera were identified from the Sinjar Formation that crop out in three selected section from northern Iraq. The selected sections: (Derbandikhan ,Qara dagh, Wara Mali has been measured in the field and closely sampled to undertake details. A number of (131) samples were collected illustrating all the lithological changes along the sections, The limestone in the studied section is rich in algae and large benthic foraminifera, The investigation of the thin sections allowed us to identify the (47 ) species of foraminifera and (34) species of algae , Five biozones were distinguished for algae which are :a- Amphiroa iraquensis range zone ,b- Trinocladus perplexus range zone ,c- Lithothamnium – Pagodaporella wetzeli –Lithoporella melobesides Assemblage zone ,d- Cymopolia kurdistanensis- parkerella Sp.- Dissocladella deserta - Jania Sp. Assemblage zone, e- Clypeina merienda –Distichoplax biserialis -Mesophyllum Sp,.-Archaeolithothamnium cf dollonii Assemblage zone. Five biozones were distinguished for large benthic foraminifera which are :- a-Cuvillierina sireli – Cuvillierina vallensis - Cibicides nammalensis – Rotalia trochidiformis Assemblage zone ,b-Miscellane miscella –Discocylina varians Assemblage zone , c-Idalina sinjarica –Nummulites globulus –Spherogypsina globula –Somalina Sp.- Alveolina globosa Assemblage zone, d-Orbitolites Sp. - Assilina Sp.- Ovulites Sp.- Cribogoesella Sp, Assemblage zone, e-Opertorbitolites transitorius range zone. The age of this formation is Late Paleocene-Early Eocene in the studied section. تناولت هذه الدراسة تشخيص الطحالب و الفورامينيفيرا القاعية ضمن تكوين سنجار في مقاطع مختارة من شمال العراق,والتي تعود لعمر الباليوسين المتأخر- ألأيوسين ألمبكر.تم أختيار ثلاثة مقاطع لهذه الدراسة وهي : مقطع دربندخان (40) م ومقطع قره داغ (70) م ومقطع وره ملي (45) م .وقد تم جمع (131) نموذجا اعتماداعلى التغير في صخارية التكوين, كان الغرض منها تحديد عمر التكوين والبيئة الترسيبية لترسبات تكوين سنجار.لقد تمثلت ترسبات تكوين سنجار في هذه المقاطع بالحجر الجيري الصلد الحامل الطحالب و للفورامينيفيرا القاعية, بعد دراسة الشرائح الرقيقة لهذا التكوين تم تحديد ( 47) نوعا من الفورامينيفيرا القاعية و(34 ) أنواع من الطحالب . وقد تم تميز خمسة أنطقة حياتية للطحالب وهي:- a-	Amphiroa iraquensis range zone ,b- Trinocladus perplexus range zone , c- Lithothamnium – Pagodaporella wetzeli –Lithoporella melobesides Assemblage zone ,d-Cymopolia kurdistanensis- parkerella Sp.- Dissocladella deserta-Jania Sp. Assemblage zone, e- Clypeina merienda –Distichoplax biserialis -Mesophyllum Sp,.-Archaeolithothamnium cf dollonii Assemblage zone, وخمسة انطقة حياتية للفورامنيفرا القاعية وهي:- a-	Cuvillierina sireli – Cuvillierina vallensis - Cibicides nammalensis – Rotalia trochidiformis Assemblage zone ,b-Miscellane miscella –Discocylina varians Assemblage zone , c-Idalina sinjarica –Nummulites globulus –Spherogypsina globula –Somalina Sp.- Alveolina globosa Assemblage zone, d-Orbitolites Sp. - Assilina Sp.- Ovulites Sp.- Cribogoesella Sp, Assemblage zone, e-Opertorbitolites transitorius range zone. اما عمر التكوين فقد تم تحديده بعمر الباليوسين المتأخر-ألأيوسين المبكر ضمن المقاطع المختاره في هذه الدراسة اعتمادا على المتحجرات المتواجده فيه. In this paper, we will generalized some results related to centralizer concept on prime and semiprime Γ-rings of characteristic different from 2 .These results relating to some results concerning left centralizer on Γ-rings. في هذه البحث ، سوف نعمم بعض النتائج المتعلقة بمفهوم التمركز على الحلقات الاولية وشبه الاولية من النمط كاما التي ممثلها لا يساوي 2 هذه النتائج متعلقة مع بعض النتائج للتمركز الايسر على الحلقات من النط كاما. In recent years, the iris biometric occupies a wide interesting when talking about biometric based systems, because it is one of the most accurate biometrics to prove users identities, thus it is providing high security for concerned systems. This research article is showing up an efficient method to detect the outer boundary of the iris, using a new form of leading edge detection technique. This technique is very useful to isolate two regions that have convergent intensity levels in gray scale images, which represents the main issue of iris isolation, because it is difficult to find the border that can separate between the lighter gray background (sclera) and light gray foreground (iris texture). The proposed method tried to find iris radius by seeking in the two iris halves (right and left) circularly, in term of certain angles interval for each half, to avoid the existence of the upper and lower eyelids and eyelashes. After the two radiuses (i.e. for each half) had been determined, the iris final iris radius would be evaluated to the minimum value of them. This method tested on all samples of CASIAv4-Interval dataset, which consist of 2639 samples, captured from 249 individuals, and distributed on 395 classes, the accuracy of the testing was 100% for outer boundary detection.أخذت قزحية العين جانب كبير من الأبحاث المختصة بأنظمة تمييز الأشخاص عن طريق الصفات البيومترية في السنوات الأخيرة، نظراً لما تتمتع به هذه الصفة من دقة عالية في التمييز واثبات هوية المستخدمين، وبالتالي توفير أمان عالي للأنظمة المعنية. هذه المقالة البحثية تستعرض طريقة كفوءة لاستكشاف الحدود الخارجية للقزحية، باستخدام شكل جديد لتقنية الخط الموجّه. هذه التقنية مساعدة جداً لعزل منطقتين لها مستويات متقاربة من التدرجات الرمادية في الصور الغير ملونة، وهو ما يمثل أحد مشاكل عملية عزل قزحية العين، لأنه من الصعب إيجاد الحدود الفاصلة بين خلفية الصورة ذات اللون الرمادي الأفتح (بياض العين) والأجسام الواقعة عليها ذات اللون الرمادي الفاتح (نقشة القزحية). الطريقة المقترحة تحاول إيجاد نصف قطر القزحية بالبحث في جانبيها الأيمن والأيسر بشكل دائري، وضمن حدود فترة معينة من الزوايا لتجنب وجود الجفون والرموش العليا والسفلى. بعد ان يتم تحديد نصف القطر في كلا الجانبين، يتم اعتماد نصف القطر النهائي عن طريق إيجاد نصف القطر الأقل بينهما. هذه الطريقة تم إختبارها بإستخدام كل عينات قاعدة بيانات CASIAv4-Interval، والتي تحتوي على 2639 عينة مأخوذة من 249 شخص، وموزعة على 395 صنف، وكانت نسبة النجاح فيها 100% في إستكشاف الحدود الخارجية للقزحية. Iris Biometric --- Iris outer boundary --- Iris segmentation --- Leading edge technique --- Convergent intensities isolation. Clustering algorithms have recently gained attention in the related literature since they can help current intrusion detection systems in several aspects. This paper proposes genetic algorithm (GA) based clustering, serving to distinguish patterns incoming from network traffic packets into normal and attack. Two GA based clustering models for solving intrusion detection problem are introduced. The first model coined as GA #1 handles numeric features of the network packet, whereas the second one coined as GA #2 concerns all features of the network packet. Moreover, a new mutation operator directed for binary and symbolic features is proposed. The basic concept of proposed mutation operator depends on the most frequent value of the features using mode operator. The proposed GA-based clustering models are evaluated using Network Security Laboratory-Knowledge Discovery and Data mining (NSL-KDD) benchmark dataset. Also, it is compared with two baseline methods namely k-means and k-prototype to judge their performance and to confirm the value of the obtained clustering structures. The experiments demonstrate the effectiveness of the proposed models for intrusion detection problem in which GA #1 and GA #2 models outperform the two baseline methods in accuracy (Acc), detection rate (DR) and true negative rate (TNR). Moreover, the results prove the positive impact of the proposed mutation operator to enhance the strength of GA#2 model in all evaluation metrics. It successfully attains 6.4, 5.463 and 3.279 percentage of relative improvement in Acc over GA #1 and baseline models respectively. مؤخراً حصلت خوارزميات التجميع على اهتمام من قبل البحوث ذات العلاقة حيث تساعد أنظمة الكشف الحالية في نواحي عدة . هذا البحث يقترح الخوارزمية الجنية باعتماد على تقنية التجميع , حيث تساعد لتمييز الأنماط القادمة الى الشبكة فيما اذا كانت نمط طبيعي او نمط هجومي. تم تقديم نموذجين لمشكلة كشف التسلل النموذج الأول أطلق عليه أسم GA #1 حيث يتعامل مع ميزات حزمة شبكة الرقمية ، بينما اطلق على النموذج الثاني GA #2 التي تتعامل مع كل ميزات حزمة الشبكة. علاوة على ذلك , تم اقتراح معامل طفرة جديد لميزات الثنائية والرمزية لحزمة الشبكة . حيث ان المفهوم الرئيسي للمعامل الطفرة المقترح يعتمد على القيمة الاكثر تكرار للميزات حزمة الشبكة باستخدام معامل . mode ولغرض تقييم الخوارزمية الجينية باعتماد على تقنية التجميع المقترحة لكشف التسلل يتم باستخدام مجموعة بيانات NSL-KDD ومقارنتها مع طريقتين هما k-means, k-prototype للحكم على أدائها وأثبات القيم التي تم الحصول عليها من التجميع .اتثبت التجارب العملية فعالية النماذج المقترحة لمشكلة كشف التسلل . أن نماذج المقترحة GA # 1 و GA # 2 تمتاز بأداء متفوق على الأساليب التقليدية في كافة المقاييس من حيث مقياس( ACC)، كشف معدل الكشف (DR) ومعدل سلبي صحيح (TNR). وعلاوة على ذلك، فإن النتائج ثبتت الأثر الإيجابي للعامل الطفرة المقترح لمضاعفة قوة نموذج الثاني GA #2 في كل المقاييس التقييم. حيث حصلت GA #2 على اعلى تحسن نسبي مئوي في معيار الدقة 6.4، 5.463 و 3.279 بالنسبة الى GA #1 و الطرق التقليدية. In computer vision, visual object tracking is a significant task for monitoring applications. Tracking of object type is a matching trouble. In object tracking, one main difficulty is to select features and build models which are convenient for distinguishing and tracing the target. The suggested system for continuous features descriptor and matching in video has three steps. Firstly, apply wavelet transform on image using Haar filter. Secondly interest points were detected from wavelet image using features from accelerated segment test (FAST) corner detection. Thirdly those points were descripted using Speeded Up Robust Features (SURF). The algorithm of Speeded Up Robust Features (SURF) has been employed and implemented for object in video stream tracking and matching. The descriptor of feature in SURF can be operated by minimizing the space of search for potential points of interest inside the scale space image pyramid. The tracked interest points that are resulted are more recurrence and pother free. For dealing with images that contain blurring and rotation, SURF is best. Fast corner detector can be employed along SURF method to build integral images .The integral images can be used to enhance the speed of image matching. The features that are extracted from video images are matched using Manhattan distance measure. Apply the algorithm of FAST corner detection along SURF descriptor of feature; tracking and matching adequacy is better, fast and more efficient than Scale Invariant Feature Transform SIFT descriptor. The experimental outcomes displayed that the time that SURF could be taken for matching is less than the time that SIFT could be taken ,the SURF accuracy depends on number of key-points which are extracted from each frame. SURF key-points are less than SIFT key-points; therefore, SURF key-points could be considered optimal in the process of matching accuracy في الرؤيةِ بالحاسوبِ، يكون تتبع الجسمِ بصريِاً عمل مهم لمراقبة التطبيقاتِ. مشكلةً المطابقه تكون بتتبع نوعِ الجسمِ. الصعوبه الرئيسيه في تتبع الجسم هو اختيار الصفات وبناء النماذج المناسبه لتمييز وتتبع الهدف.النظام المقترح لوصف الصفات ومطابقتها بأستمرار على الفيديو يتكون من ثلاث خطوات. اولا يتم تطبيق تحويل المويجه على الصوره بأستخدام Haar فلتر.ثانياً يتم أكتشاف النقاط المهمه في الصورة المضغوطه (wavelet) بأستخدام كاشف زاوية الصفات لأختبار المقطع السريع (FAST) .ثالثاً يتم وصف تلك النقاط المهمه بأستخدام الواصف تسريع الصفات القوي (SURF) . أستخدمت خوارزمية (SURF) ونفذت لغرض تتبع الجسم ومطابقته على السلسله الفيديويه.واصف الصفه (SURF) يستطيع العمل عن طريق تقليل فضاء البحث عن النقاط المهمه المحتمله داخل هرم فضاء الصوره. النقاط المتتبعه المهمه الناتجه كانت خاليه من الضوضاء والتكرار.عند التعامل مع الصور التي تحوي على تشويه وتدوير, يكون (SURF) هو الأفضل.كاشف الزاويه السريع نستطيع استخدامه على طول طريقة (SURF) لبناء الصور التكامليه.يتم استخدام الصور التكامليه لتحسين سرعة مطابقة الصوره.يتم مطابقة الصور المستخرجه من الفيديو باستخدام مقياس المسافه (Manhattan). عند تطبيق خوارزمية كاشف الزاويه السريع مع واصف الصفه (SURF) ; فان كفاءة التتبع والمطابقه تكون الأفضل ,سريعه واكثر كفاءه مقارنة مع واصف الصفه ذات مقياس التحويل الثابت(SIFT). أظهرت النتائج التجريبية أن الوقت الذي يمكن ان تأخذه (SURF) للمطابقة أقل من الوقت الذي يمكن ان تأخذه (SIFT)، وتتوقف دقة (SURF) على عدد النقاط الرئيسية المستخرجة من كل (Frame) . نقاط مفتاح (SURF) أقل من نقاط مفتاح (SIFT).لذلك يمكن اعتبار نقاط مفتاح(SURF) مثالية في عملية مطابقة الدقة. In this research pulse high voltage circuit was used including resistance, inductance and capacitor to achieve an experiment of cylindrically-tipped of plasma switch .The charging voltage of up to 9kV using Rogowski coil and current-shunt resistance (CVR) used to measure pulsed electrical discharge (PED). The current in both self-triggering and third-electrode triggering modes. The pulsed current peaks 4kA and the duration of circuit pulses were recorded between 0.1μs and 0.3μs. The experimental results has shown clearly the inductance effect in the circuit parts in under damped oscillation regarding the value of circuit parts in addition to the distance of the spark gap cylindrically-tipped electrodes during the plasma propagates under air pressure with their circuit impedance. Under the range of experimental states (2-30)Ω nominal impedance ranges were recorded, rely on the gap and circuit parameters. في هذا البحث تم استخدام دائرة تعمل بفولتية نبضية عالية مكونة من مقاومة ومتسعة ومحاثة لعمل تجارب تفريغ كهربائي في مفتاح بلازماعلى شكل قضيب اسطواني مستدق حيث استخدمت فولتية الشحن فيها الى اكثر من 9 kV . ولقياس تيار التفريغ النبضي أستخدمت مقاومة مجزئ وملفات روغوفسكي ,عند انهيار مفتاح البلازما بنمطين هما التفريغ الذاتي و باستخدام قطب ثالث للتفريغ حيث كانت قيمة الذروة للتيار 4kA و زمن النبضة تراوحت بين0.1 μs و 0.3 μsبالاعتماد على مكونات الدائرة والمسافة بين الاقطاب . حيث لوحظ ظهور سلوك حثي سائد في الدائرة معتمدا على قيمة مكوناتها وخصائص البلازما المتولدة بين قطبي فجوة المفتاح وتاثير ذلك على ممانعة الدائرة النبضية . وفي هذه الظروف التجريبية المعطاة وجد ان القيمة المطلقة للممانعة تتراوح بين 2 اوم و30 اوم معتمدة على حالت التذبذب وطريقة دراسة وتحليل نتائج اشارات تيارالتفريغ الكهربائي. Pulsed electrical discharge --- Impedance characteristics --- high voltage plasma. The extrasolar planets in the vicinity of stars are expected to be bright enough and are very difficult to be observed by direct detection. The problem is attributed to the side loops of the star that created due to the telescope diffraction processing. Several methods have been suggested in the literatures are being capable to detect exoplanet at a separation angle of 4λ/D and at a contrast ratio of 10-10. These methods are more than one parameter function and imposing limitations on the inner working distance. New simple method based on a circular aperture combined with a third power Gaussian function is suggested. The parameters of this function are then optimized based on obtaining a minimum inner working distance This method is capable of detecting exoplanet with an angular separation of 4λ/D and a contrast ratio of 10-10 and it is much easier to be implemented practically. ان الكواكب الخارجية بالقرب من المناطق المجاورة للنجوم المضيئة من الصعوبة رصدها بالطرق المباشرة. ان المشكلة تكمن في الاطراف الجانبية التي تظهر نتيجة عملية الحيود خلال رصد النجوم بواسطة التلسكوبات البصرية. عدة طرق مقترحة تتضمن عدد من المعاملات والمحددات التي تعتمد على مكان الكوكب الطريقة الجديدة المقترحة مستندة على الفتحة الدائرية للتلسكوب مع القوة الثالثة لدالة كاوس والتي تم ايجاد القيم المثالية لها واصبحت لها القدرة على تحسس الكواكب الخارجية لمسافة زاوية D)/λ4) ونسبة تباين (10-10) وبالاضافة كونها سهلة ويمكن تطبيقها عملياً .